Welcome to our Tahoe home! We are remodeling our house every year, so check out the new pictures! 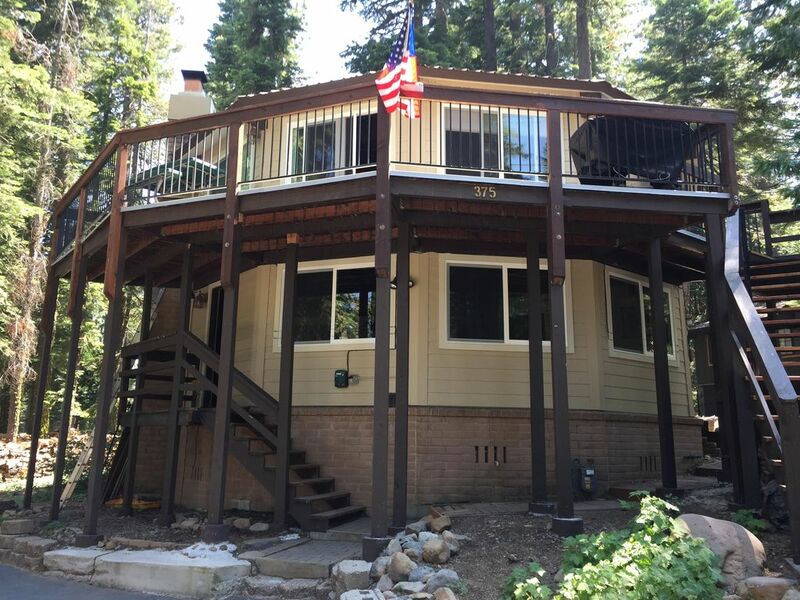 This 1600 sq ft. home, between Homewood and Tahoe City, is 12-sided and backs up to National Forest Service land and Blackwood Canyon (a wonderful hike, bike, ski, snowshoe and bring-the-kids explore area)--A perfect place for a get-away any time of the year. It's homey, comfortable, has tons of charm and amenities, and is perfect for up to 7 people. We have a lovely, inviting stone fireplace with gas starter. ***For exact location, please look up Elizabeth St., Homewood, CA. There are filtered lake views from our deck, and you are within an hour's drive (depending on road conditions) to anywhere on the lake--skiing, hiking, casinos, rivers, lakes, and/or shopping. We are close to Tahoe City and Homewood, Alpine and Squaw ski areas, the Rubicon Trail and Truckee. There are 2 formal bedrooms (one with a queen bed and the other with a double and twin bed), one sleeping area downstairs with twin beds and curtains for privacy (counts as a 3rd bedroom), a fold out couch that sleeps one adult or 2 children, and a fold up single bed, 2 full bathrooms, 2 TV's (one up, one downstairs), and 2 VCR/DVD's. Smart phone coverage is fair to good (depending on your carrier) with possible internet. We do not have wifi. We also own a large buoy and can rent that out in addition to staying in our home. The association has a beautiful beach and a picturesque dock. You can walk down and watch the lake, admire the beautiful surrounding mountains, and of course, relax! This house is available for nightly, weekly or monthly rental all year long. Per night price may vary depending on time requested. For more information or to book this home, please call or email Trudy. english, A little French too! Our house has been furnished as a second home for my family, not as a rental, it's low key and comfortable. We love using it and love being up at Tahoe, any season. Each year, a part of the house gets remodeled, so it looks better and better each season. Come and experience a wonderful place! Note: This photo was taken on my bike ride around Crater Lake. Tahoe is a great place to ride your bike too! My parents chose to buy property at Tahoe back in 1968 because we could enjoy staying there for any season. We were a boating, water skiing and snow skiing family, so Tahoe was a natural choice. It has been a great house in a wonderful, beautiful location. Peace and quiet, beauty, trees, water, mountains, valleys, rivers, blue sky, skiing, hiking, biking, rafting... What more could you ask for! 2 full baths, one with a corner shower and one with a tub shower combination. Filtered views can be seen from the second story deck. Land line--Available upstairs, local calls only. For long distance, please use a calling card or your cell phone. To save time with laundry, you can bring your own towels, washcloths, sheets and pillow cases. Located in the mud/laundry room--brand new front loader. A beautiful stone fireplace with gas starter! Some internet may be available through your smart phone, depending on what carrier you have and other conditions. We do not have wifi. Cell phone coverage is sometimes/usually available. We do not have wifi and internet is sometimes available through your phone, though it can be slow. But please bring with you whatever food items are needed, just in case. We have a microwave and all the pots and utensils you would ever need. Many appliances are also provided, including a dishwasher. We have a dining table that seats 7. (2)-- TV upstairs has a DVD. There is also a TV/DVD downstairs. Games are located in the side table in between the 2 upstairs couches. Many videos/DVDs are provided for viewing and are located downstairs. We have a nice upstairs deck with filtered views of the lake. We do have a buoy available for an additional charge if you bring up a boat. Firewood is provided in a covered wood pile under the long stairway. Please pull replacement wood from the end and re-cover the wood. Our house backs up to National Forest Service land and Blackwood Canyon--a special area for exploring! A buoy is available for an additional charge if you would like to bring up a boat. We loved our stay there and it was a very beautiful house and the view was also very nice, would love to go back again. The house felt like home. Charming, cozy, perfect location, plenty of room. Really enjoyed snowshoeing right from the house out into miles of Blackwood Canyon open space. Totally serene experience. Trudy was very communicative and helpful. Thanks for sharing your beautiful home! Trudy was a pleasure to rent from. We enjoyed our stay! The house is so cute and feels like home. The location is amazing. Our family had a great time!!! We do hope to visit again soon. It is perfect, Tahoe City is close, the lake is right there. The home is a perfect vacation place, we highly recommend it, and hope to stay there again. We rented this property for 2 nights during new year and we had very amazing and memorable time. The house was very clean, fully furnished and very quite neighbor hood. Kids really love the place and enjoyed a lot. Best of all the owner Trudy was very helpful and provided a lot of useful information. Thanks Trudy and we will definitely come back this summer. Happy new year to you and your family. Close to the Rubicon ATV trail which is within 10 miles south of the house. The cleaning/damage/pet fees are mostly (except for $100 inspection fee plus $25 if using a credit card) refundable if, the morning that you leave, you clean the house thoroughly according to our instructions (this could take several hours), it passes inspection, and the key is returned. Any professional cleaning needed will be deducted from the fees. Payment methods such as using a credit card and Pay Pal incur a fee which will be deducted from your refunded deposit.